So, had a retro movie night, and stumbled upon this fantastic right-hand drive joke. Chevy Chase (Ty) and Rodney Dangerfield drive up to the golf course in Rodney's Rolls Royce.... The judge they're playing blows up at Chevy, thinking he's the one driving. Hilarious. I've heard this story about passengers texting in RHDs, and getting berated by police officers. That's a Rolls-Royce Silver Cloud III Drophead Coupe H.J.Mulliner Park Ward according to imcdb.com. The next installment of RHD on Film is here! Rolls-Royce Silver Wraith or Rolls-Royce Phantom are the two candidates. Beautiful car, and the interior shot is a nice touch to prove that it is indeed a right-hand drive. 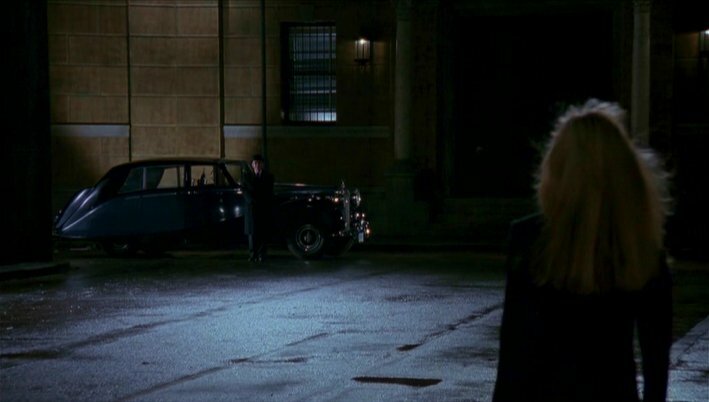 This being Gotham City (New York), this car would be very out of place. A FX classic for people who have tweaked senses of humour. This episode (Season 3 Episode 4) has Archer losing his new 'spy car', spending the episode trying to hunt it down. While trying to hunt down his car, he infiltrates the Yakuza via an underground drift tournament, thinking they might have knicked his car and were racing it. Turns out they only race imports, to which Pam replies: "Right hand drive, duhhh". Here's a clip of the quote, and some cartoon drifting fun. That's it for this round. Obviously I can't watch every movie ever... if you spot something that I can add to my list, contact me! I've found a few more 'mixed drive' shots of right-hand drive cars, as an extension of Right Hand Drives on the Big Screen from a while ago. The rules are that the car must be a right-hand drive in left-hand drive traffic. Darkwing Duck (that people of a certain age will be all misty-eyed over) has a motorcycle that magically changes from LHD to RHD. It's either a mistake, or just looked better that way for these shots. It's 'wrong' in all but one of the shots it's in. And finally, Arrested Development in the episode 'For British Eyes Only'. Canadian actor Dave Thomas pulls up beside Michael (who is driving the stair truck) and starts making hand signals at him after Michael's time in 'Little Britain' (which drives on the left side of the road, despite the fact it's in America). I believe he's dring a Triumph, but I could be corrected on that. It's something British, at any rate... and probably lives in LA somewhere. So, hypothetically it's 25 years old or older. Right hand drives are still relatively uncommon in Hollywood Movies, though there are some exceptions. I've found a few examples that I thought I'd share. I've decided to limit the movies to 'Right hand drives in Left hand drive countries' to shorten the list. Otherwise I could just say every British movie ever. This is the movie that kind of inspired this post. I was watching Borat! and when he bought the RHD ice cream truck I literally laughed out loud. Clearly they chose an RHD because it's unusual, which is what the movie is all about - being unusual. I was actually sad when he left it behind. Sorry, I don't know the make/model of this one! Borat!© 20th Century Fox - Buy it here. Limiting my options to the original movie, which was a landmark in 'racer' movies. The RHD that was really stand-out in this movie was also not shown for very long. Leon's "Yellow Bird" R33 Skyline confused a lot of people. The time it get the longest screen time is when Leon is telling a pizza guy to go around. Initially there were complaints from people saying that it was a mistake! People thought that the frame was being mirrored for continuity. Little did they know that the car was indeed a right hand drive. The Fast and the Furious © Universal Studios - Buy it here. Spy Who Loved Me also has James Bond cruising around RHD in a LHD country, this time a RHD Lotus Esprit in Sardinia. There's a good scene where James is having a little trouble passing because of where the driver's seat is. It's pretty fun, completely over-the-top movie. Goldfinger © Eon Productions - Buy it here. I'm breaking my own rule here. Officially the Mad Max movies were filmed in Australia... but it's post-apocalyptic, so is it really still an RHD country then? That being said, this is a pretty cool movie car-wise. The 'Interceptor' that Max (Mel Gibson) drives has a huge blower coming out of the hood that is controlled by a switch in the car. Why you'd ever want it off is beyond me, but it's still pretty awesome. This movie hasn't aged very well, and you're probably best off just watching Mad Max 2 - The Road Warrior, the rest is rubbish. The cars are really entertaining to see in this movie since it's has some sci-fi roots. There's a gigantic RHD semi... and lot's of highly modded cars that are 'middle drive'(?). And a tractor. With and angry man. How can you go wrong! This also created an RHD scene in The Simpsons episode 'Beyond the Blunderdome' (Season 11, episode 1). Homer is helping Mel Gibson do a remake of a film, which Homer mangles completely... long story short: A car chase down Hollywood Boulevard in the tractor from a Mad Max movie (I think it's supposed to be from The Road Warrior, but I can't tell). Mad Max © Warner Home Video - Buy it here. The Simpsons © Twentieth Century Fox - Buy it here. This is a ride in a mall here in Winnipeg (St. Vital Walmart, if you're curious). I saw it and couldn't resist. I guess Mickey has a right hand drive, but has gotten a DUI, so we have to drive him around. Yes that's me. I have no shame.